Taste test: These triangular chips were thicker and less dense than ordinary tortilla chips, and they tasted pretty good, with a scoop-like shape on most of the chips that would be good for picking up dip. Everyone who tried them had good things to say. 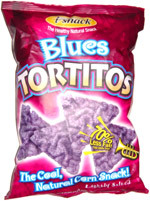 However, the chips in the bag barely resembled the ones pictured on the front. The ones pictured on the bag had odd bumps and ridges on them, sort of resembling the texture of a brain, but the real ones were much smoother in shape. Smell test: Kind of a chemically smell, but sort of corn-like too.